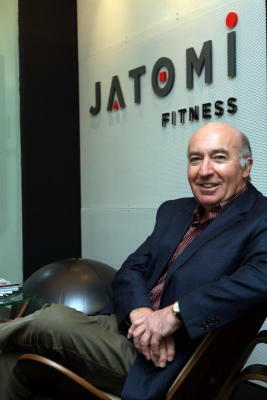 Michael Balfour, the man behind Fitness First and Jatomi spends about six months in a year in Malaysia. He hopes he will be able to spend more time here now that his new business has arrived from Europe. MICHAEL Balfour spends about six months in a year in tropical Malaysia, and says he hopes he will be able to spend more time here now that his new business has touched down from Europe. Balfour's story started in 1985 in Houston, Texas, when he was part of the board of directors for an upmarket health club. His four-year stint with the Houstonian Club opened his entrepreneurial eyes to what the industry lacked. “I was with the board and that was how I realise what the Americans have done for the health club industry that we hadn't done in the UK,” he tells StarBizWeek. Spotting a business opportunity, Balfour returned to the UK to start a fitness club business called LivingWell. Two years on, the chartered accountant purchased a bankrupt old squash club in Bournemouth called the Queens Park Health Club. Balfour notes that 20 years ago, people had to have a well-paying job to be a member of a health club. Together with his team, Balfour is a pioneer of dry clubs, or health clubs without swimming pools. Thus the brand Fitness First was born. Today, the famous brand has about 1.5 million members internationally. Like most successful stories, Fitness First begins with its fair share of struggles. In the first four years, Balfour managed to open only five clubs. “We struggled like everybody else (starting a business) to find the money. Then we floated on the London Stock Exchange in 1996 and that gave us access to more money,” he says. The company floated with a valuation of £14mil. Injected with cash, Balfour opened eight clubs the following year and 13 clubs in 1998. Three years after listing, Fitness First went international. “Eventually we were opening clubs on an average of two every week, somewhere in the world,” he gleams. Fitness First was taken private in 2003 in a £415mil management buyout, and sold to a private equity firm in 2005. Balfour stayed on for another four years before itching for a new scene. “It was about that time that we decided to start Jatomi,” he says of his current project. Balfour and his co-founders have invested 600 million euros in Jatomi thus far. Where Fitness First is for the mass market, Jatomi specialises in emerging markets starting first in eastern Europe, then Turkey and now Asia. Jatomi came to Malaysia early this year. On trends affecting the industry, Balfour says that the statistics for obese people are higher than on starving people in the world now, a sign that more people need to take fitness more seriously. And for exercise trends, clubs are going for more functional exercise now and more people prefer working with a personal trainer. “In my opinion, there are not enough people my age exercising,” he says, pointing out a gap in the market, “Most of those who sign up for clubs are between 20 and 40 years old. The 63-year-old thinks that clubs need to be designed to suit older people as well because longevity is increasing. “As medical science keeps most people alive longer, they need to make sure they are fit enough to live those extra years that medical science is giving,” he says. Jatomi is the clever abbreviated version of the founders' names, James, Tony and Michael. However, he is a firm believer in fitness. Balfour's ideal routine would be to exercise three times a week but he notes that travelling on business often disrupts his intentions. Before leaving Fitness First, Balfour also started a few other businesses. His philosophy on starting a business is to create a product or service that gives a lot for a lot less money. In 2007, Balfour founded the exclusive ownership property fund The Hideaways Club with a team. The club purchases luxury villas and city-centric apartments globally which make up its fund and people who buy shares in that fund are able to own and use the villas. The club has over 55 properties. “This is not time share but equity share and is probably the financially astute way of investing in a property,” he says of the first-of-its-kind business model. Whether or not he starts up businesses to sell and profit fromthem, Balfour says he prefers starting and growing businesses. Aside from starting businesses, Balfour has taken time to make a bucket list film, “to leave behind a legacy” for his family. Balfour wants to share with his grandchildren and great grandchildren how he started Fitness First, what he had to go through and what advice he has for them. “I would have loved to know what my grandfather was thinking about and how he looked like and talked but the technology was not available then,” he says. Balfour thought the same for companies, which after achieving a level of success, their history are often forgotten. Balfour says it is important to remember a company's original vision so that the staff and customers can buy into what the company is trying to achieve now. Balfour recently launched legacy films of his companies in October. As for his personal legacy film, the kind of words he leaves behind echoes what he stood for and what his vision was as well as advice on starting up businesses. Unfortunately, the film is only for the eyes of the Balfours. A key advice from Balfour is to always be agile enough to change the plan when things do not pan out as expected. When days are dreary, Balfour's other antidote to despair is “an enormous sense of optimism”. He admits to being accused of always looking at the bright side. He adds that when he started dry clubs, many naysayers thought it could not work because club-goers needed the pools and restaurants. “Even experts said it wouldn't work. There was a quote swimming pool or die', which I remember reading,” he says of going against the trend, which has granted him first-mover advantage with Fitness First and The Hideaways Club. As a manager, Balfour believes in being inclusive with his staff. Values: There are solutions to every problem. People don't spend enough time analysing problems.